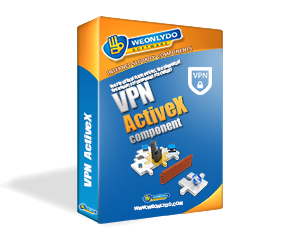 wodVPN is VPN peer-to-peer ActiveX component that is used to establish Virtual Private Network between two peers. All P2P communication is encrypted and secured. Peers are able to forward local and remote ports, send messages, etc. TCP and UDP packets can be sent. Peers can be located using free mediator script. wodVPN is VPN peer-to-peer ActiveX component that is used to establish Virtual Private Network between two wodVPN instances over internet. All communication between those peers is encrypted and secured. Peers are able to forward local and remote ports, send messages, etc. UDP packets are used to transfer data between peers, in which case several techniques are available to make direct NAT 2 NAT connection between peers. And if direct connection is not possible (in really rare cases), wodVPN can be used as relay between other instances as well. AES128 encrypts all packets between two peers using password of your choice - unbreakable security is in place! wodVPN can be used to connect through VPN to your SQL server (which is mapped through local port), share pictures, documents and files. You can also use it to provide "remote desktop" feature through the VPN. Virtually any service that uses TCP or UDP can be "mapped" to work over wodVPN. Through provided virtual network adapter you can relay full network traffic to remote peer. You can assign each peer IP address of your choice, and packets for remote IP are forwarded through wodVPN to remote peer, which then "pushes" it to his network adapter. This way remote peer appears to be on your local LAN (and vice versa) - no matter where he is actually connected from. We have provided 'xVPN' standalone application (bundled with the installer) which will run on Linux, Cygwin, FreeBSD and OpenBSD. You can use it to establish link with your application with those systems - ideal for making P2P with them when security is most important - xVPN does *NOT* require firewall to be opened on those systems! Using wodVPN you can establish link between two points and transfer large amounts of data with no worries where are those peers actually located. wodVPN takes care of everything needed for secure and reliable transport. Call Search method to search for remote peer's IP/Port (if they are not known). Once SearchDone is fired, you call Connect with provided IP/Port and you're connected. wodVPN implements SOCKS4/4A/5 protocol so any application capable of using that proxy server can establish connection through wodVPN. Mediator script is provided free of charge. You can use, during tests, our mediator on mediator.weonlydo.com on port 8000. For your own use, we would suggest you put online your own mediator (we cannot guarantee 100% uptime of ours). Mediator is needed only if you need ability to locate remote peers. Anything can be mediator... Any service that is online and available to all of your peers can be adjusted to be mediator. You just need to make it exchange simple UDP packet with both peers.